In the springtime the fields are filled with resting geese, cranes, swans and waders. 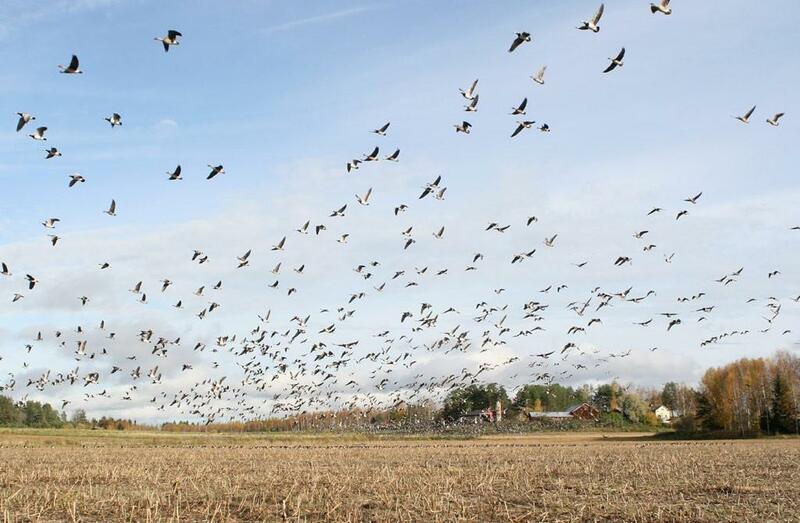 The open fields of Jyrkilä offer good possibilities for watching the migrating birds of prey. During summer, for example, western yellow wagtails and ortolan buntings are nesting in the fields of Pohjasuo. These birds are less common in other areas of Parikkala. In early autumn, you might be able to spot hundreds of cranes in Jyrkilä. Later on, the field is filled with swans. When the cranes are gone, geese start to arrive. 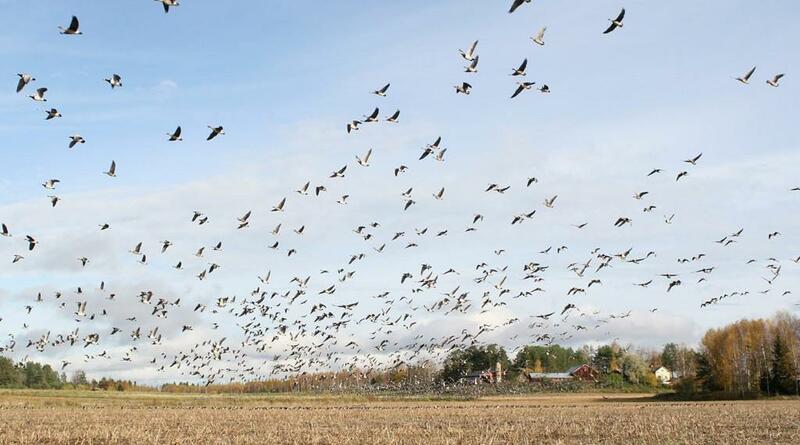 Usually there are thousands of geese flying around and over the fields in Jyrkilä and Pohjasuo and the lake Pien-Rautjärvi. The large bird masses draw out White-tailed eagles which in turn drive away the geese. Jyrkilä fields are located to the north of Mikkolanniemi village. From Highway 6, turn to Niukkalantie road and drive to the direction of Tarnala village. A few kilometres after Tarnala turn to Jyrkiläntie road on the right. Jyrkiläntie goes through the fields and birds can be watched along the road. Be careful while stopping by the road, do not block the traffic. Jyrkiläntie ends near the Tarassiinlahti bay on Pien-Rautjärvi lake and the Mikkolanniemi Activity Centre. Pohjasuo fields are located near Highway 6, to the northwest of Pohjanranta. From the highway, turn to Pohjasuontie road. The road runs through the fields. Be careful while stopping by the road, do not block the traffic.